Leisure Knoll puts you close to the welcoming beaches of the Jersey Shore. 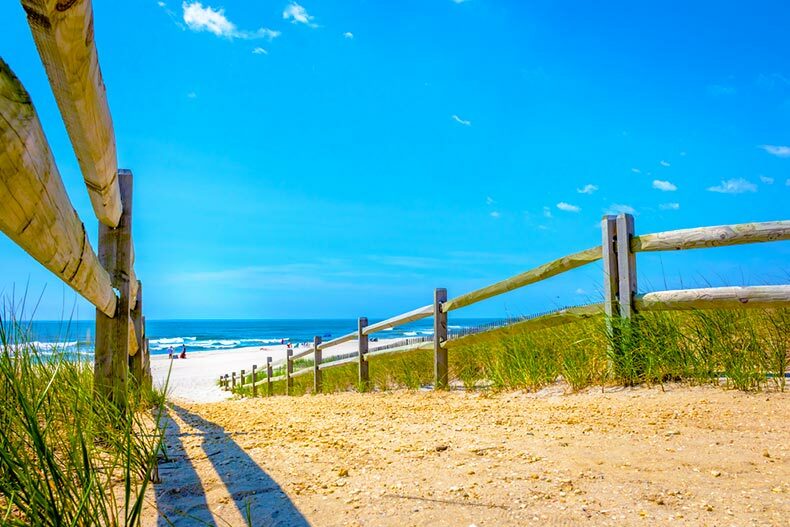 Ocean County in New Jersey has been a popular retirement destination for active adults who enjoy a four-season climate, exciting recreational activities, and easy access to big cities. There are plenty of good active adult communities to choose from here but Leisure Knoll in Manchester is one that certainly stands out. This established development of 1,626 homes built between 1979 and 1999 remains among the most reasonably priced active adult communities in the state with prices ranging from below $100K to the low $200s. Buyers can choose from 15 different models, each offered with open floor plans from 980 to 1,728 square feet. Most of the homes have two beds, one bath, an attached garage, and first-floor master suites. Leisure Knoll is a gated community, which keeps traffic at a minimum. The winding streets are lined with mature trees and lovely landscaping. A homeowners association fee provides for snow removal and lawn maintenance, which allows residents more time to enjoy daily life. Ocean County is packed with things to do but Leisure Knoll residents also enjoy staying put to enjoy the amenities on hand. The active Timberland Hall clubhouse includes a fitness center, game rooms, and library. Members of Leisure Knoll’s 20+ social, sporting and other clubs meet here to plan exciting outings, projects, and community events. There is also a performing arts center on the grounds, which holds large meetings, dances, and other entertainment. Outdoors, there are ponds and lakes, a picnic area and gazebo, shuffleboard, tennis courts, a putting green, and an outdoor pool and patio. Leisure Knoll is very close to the Pine Barrens and is also only 15 miles from various nature parks and beach resort communities, including Asbury Park, Point Pleasant, and Ortley Beach. Residents can hop right over to a shopping center across the street that has a large grocery, home improvement and garden store, and two restaurants. Plus, there are plenty of grocery stores, places of worship, banks, gas stations, restaurants, and shopping within close driving distance. Larger towns like Toms River and Freehold present even more options for active adults. There are four premier golf clubs close by, including Eagle Ridge Golf Club and Pine Barrens Golf Club. Top medical providers like Hackensack Meridian Health and Monmouth Medical Center are just minutes away. Traveling out of Manchester is easy with international airports in Newark and Philadelphia within an hour’s drive. Major highways near this community include Route 70, Route 9, and the Garden State Parkway.